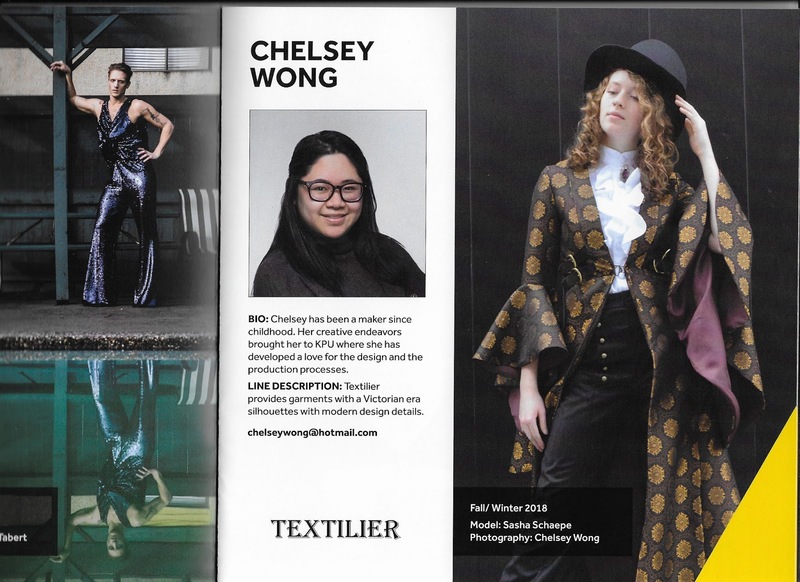 Today's interview is with Chelsey Wong of Textilier. 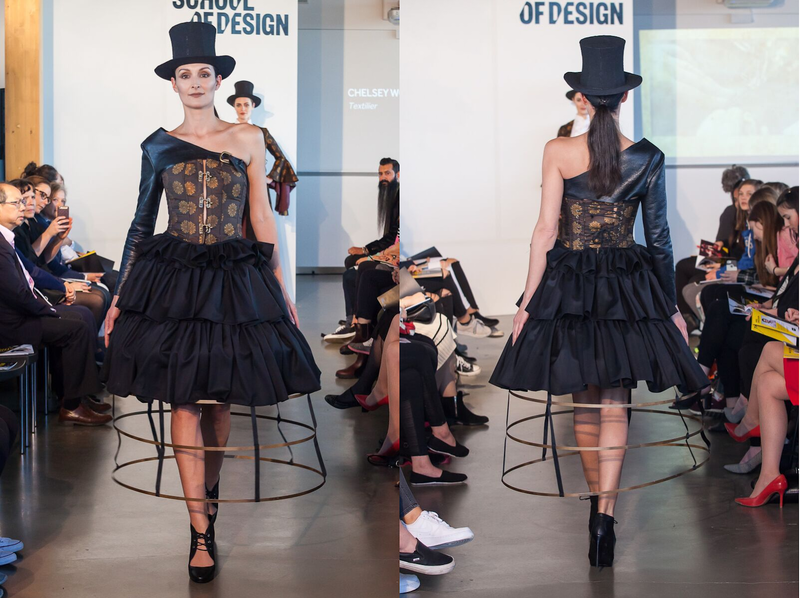 What drew me to her collection was the theatrical element combined with great fabric choices and strong tailoring. 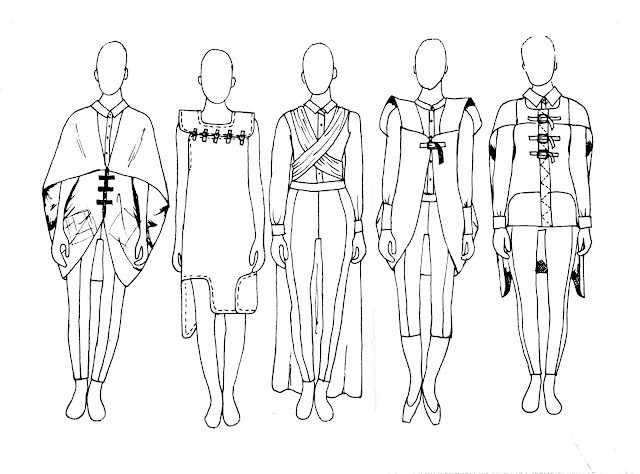 She offered Victorian era silhouettes with modern design details. Film, TV, stage and Steampunk would all be natural outlets for her work. I was born in Guangzhou, China, but have grown up and lived in Barnaby, B.C., Canada. As a child, I was involved in lots of after school activities ranging from ballet, art (drawing. painting, sculpture), pottery, soccer, swim, skating, etc. I enjoyed keeping my hands busy by making arts and crafts in my free time. I was pretty shy when I was younger, and also quite a tomboy. However, I still liked reading fashion magazines and dressing up. In high school I became more interested in fashion, more specifically, in making clothing. This is when I learned how to sew with a sewing machine (in Home Economics. Grade 8). My friend and I started to get into DIY culture at this time. We would make our own band t-shirts because we were too young to get into the cool concerts. Besides the band t-shirts, I was making and customizing jewelry, bags, apparel and decor. My father will always tell everyone that when I was a small child, I made my own slippers out of paper and masking tape, and from that point on he knew I was going to be a creative-minded child. As child, I would cut up old magazines you could purchase at the library for 25 cents and create (what I now know is called) a mood board/ inspiration board. Nothing would come from these boards, they were just something I liked to create. Besides that, my keen interest in sewing was probably a big clue that I would end up pursuing fashion. Once I learned how to sew, it was like a whole other world was opened up to me. I could create using fabrics and they were a lot more sturdy than paper. Not only did a sew clothes, but I also customized them too with paint and iron-on graphics. 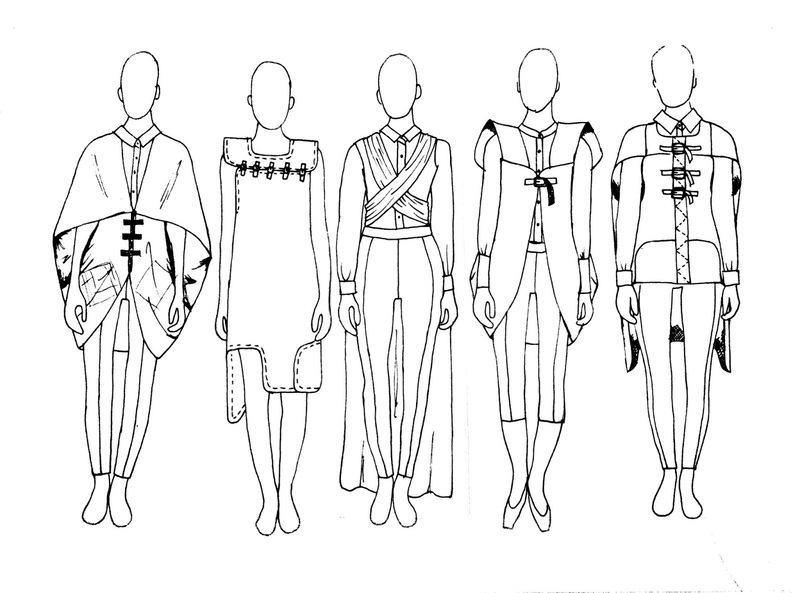 I decided to study fashion design when I was in grade 11 (about 17 years old) because I was prompted by my high school Textiles teacher to consider it (at the time I was also considering science and electrical but both weren't serious). My parents were surprisingly supportive of me pursuing a career in fashion, though they still worried a bit about the post-grad job prospects and told me to have a Plan B (I never did have one!). 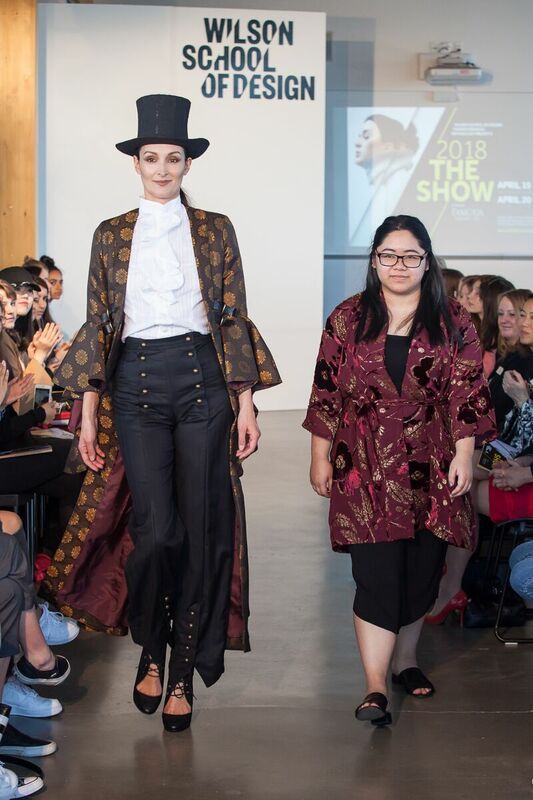 I chose to study at KPU's Wilson School of Design program because it would fully prepare me for Vancouver's fashion industry: I would be learning every part of the process- ideation, experimentation, production and business. The cherry on the top was it is a degree serving program. 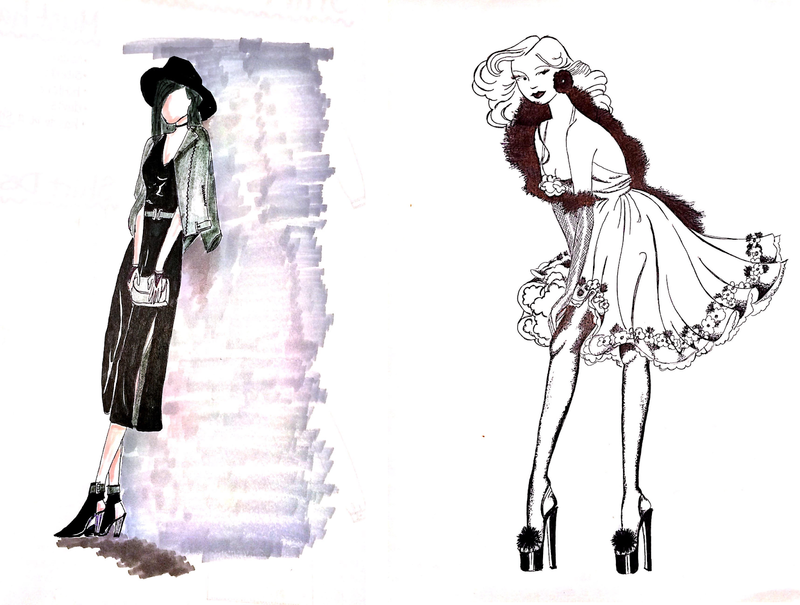 Studying fashion design was a mix of highs and lows. Coming into the program, my thought processes for production was already quite developed, but I really struggled with the design process, specifically the ideation/ creation stage. My time at KPU has taught me to trust my research, which is how I get my ideation stage to start. One memorable high moment during my time at KPU would be the day I got approved to go on exchange. Going to England had been on my bucket list for years and now I had the opportunity to live there! It was a big moment for me personally as well: it was the first time I would truly be away from my friends and family. My inspiration for Textilier came from my semester spent studying abroad. I chose to go on an exchange to England in my third year. I absolutely loved my time spent there. Nothing can compare to being in such an old city. I loved how you could walk around London and see landmarks from the time of the Great Fire of London, but at the same time, spot a modern glass building. 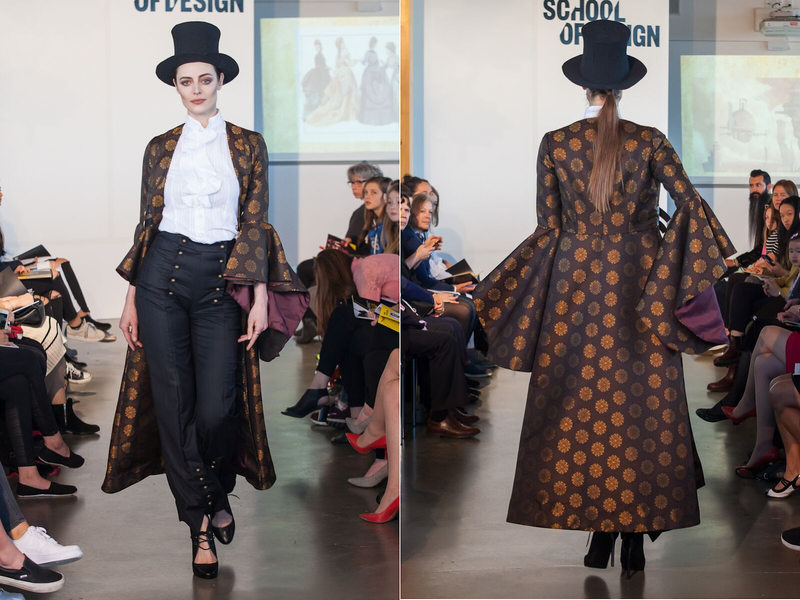 Arguably, London is the birthplace of Steampunk (the style of Textilier), so my designs were inspired by Victorian clothing and some modern design elements. Textilier is for the woman who uses steampunk to express themselves and wants high quality pieces that they can wear everyday. 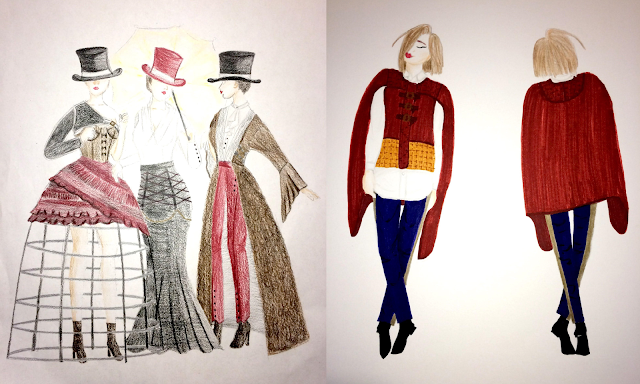 I based the colour palette on what was in fashion for 1870. The colours are deep and have a warm tone. The base colours are browns, black and white with accents of deep burgundy and antiqued brass. I used natural fibers such as cotton shirting and wool suiting, which would have been accurate to Victorian times and accented with a polyester jacquard which is the modern element. 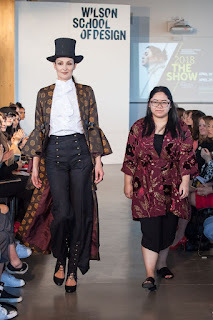 I don't have a favourite look, but I am still in love with the jacquard fabric that was used for the long coat and corset. Hopefully I can bring a fresh set of eyes along with my interest in more theatrical pieces to keep fashion fun. From here, I am working at a small Vancouver Fashion company, but I hope to segue into the film industry and work in costuming.